Have you ever wondered how to turn your windows into solar electricity source with AC power plug? Solar panel portable 220V / 110V is the perfect answer how to do this. Just to mention, this invention has nothing to do with Microsoft company, design is completely done by Korean tandem Boa Oh&Kyuho Song! 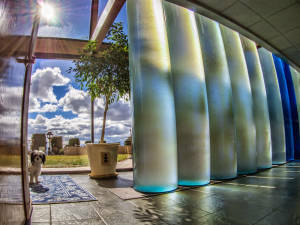 Simple in design, yet very effective, this unique product offers a cool way to collect sun energy and use it instantly, or use it later (there is a battery inside) as a regular mains socket, supplying any small electrical device with needed power (US 110V / Europe 220-230V). The plug attaches easily to any window. 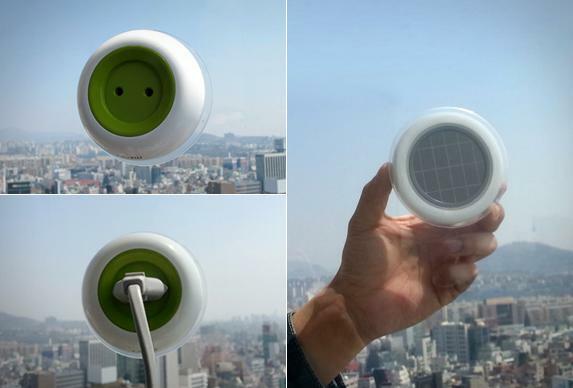 On one side of this solar powered device is a suction plate absorber constructed to be easily attached to, or removed from window surface by using vacuum. Behind suction plate there is the heart of this device - small network of solar panels which are harvesting sun`s energy converting it into electricity. 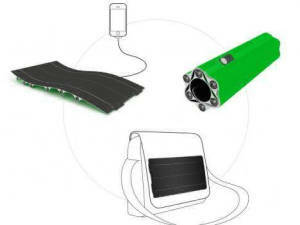 Electricity generated by solar panels is then passed on to a small charging unit which stores the energy into small 1000 mAh on-board battery. Battery is then further connected to a mini step-up transformer which brings the voltage up to 110/220V AC onto the socket located on the opposite side of this solar device. It takes 5 to 8 hours of sunlight to fully charge the battery. Unfortunately, this elegant solar powered socket wouldn’t be able to supply power to a device like vacuum cleaner, microwave oven but for small gadgets like mp3 player, tablet, ipad or smart phones, it is a perfect solution. You can even turn off the device without unplugging the cable, simply rotate the plug anti-clockwise and the power supply is instantly cut-off. During laboratory stress test (one solar-plug-it prototype has actually been tested), sample unit behaved quite well. After laying solar panel in the sun attached to a window from 9AM to 5PM, battery has been fully recharged. Testing engineers were able to extract electricity from it and to power small FM radio receiver for almost 8 hours! This is quite good result, even though manufacturer claims max 10 hour of continues power supply!